Americans with money in the stock market have a clear preference for the next president of the United States: Hillary Clinton. Among investors, 45% think Clinton would be better for the stock market versus 34% for Trump, according to the latest quarterly survey from E*Trade Financial (ETFC). The survey captures the views of people with at least $10,000 in an online trading account. It may not be a surprise that Clinton came out on top. 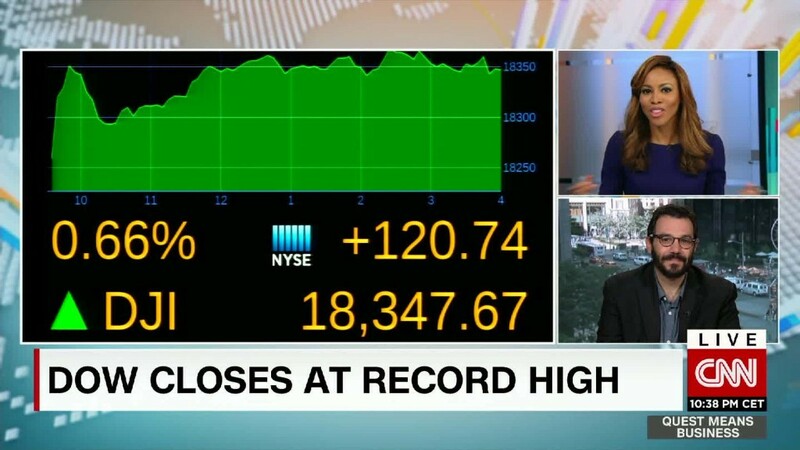 The U.S. stock market is hitting record highs. Serious investors with thousands (if not millions) in the market probably wouldn't mind more of the same from Washington D.C.: a Democrat in the White House (Clinton) and Republicans keeping control of the House of Representatives. "The markets love divided government," says Greg Valliere of Horizon Investments. "Clinton would be check-mated in the GOP House." E*Trade also asked investors which candidate would do a better for the economy. The results were similar, although not as strong for the Democrat: 41% said Clinton versus 33% for Trump. The rest of the respondents said "other" or "none of the above." The economy is the No. 1 issue in Election 2016. America may have low unemployment and decent growth, but economic anxiety remains high. Trade, reining in Wall Street and the need for more good-paying jobs have dominated the campaign trail. Even among investors surveyed by E*Trade, the vast majority gave the U.S. economy an mediocre "B" or "C" grade. Clinton and Trump are fighting to convince voters they are the best candidate to lift the economy. In other polls, when ALL voters are asked who would be the better for the economy, Trump has the edge. But there seems to be a consensus emerging on Wall Street and Silicon Valley that Clinton would be the better choice for the business and tech worlds. She has proposed a major boost to infrastructure spending to repair America's roads, bridges and IT, and she wants to raise taxes on the rich. There are concerns that Trump's plans to scale back foreign trade and put hefty tariffs on goods coming from China could start a trade war and sink the U.S. economy into a recession. The economists at Moody's Analytics predict 3.5 million job losses under President Trump and a stock market correction (if not worse). A Trump adviser calls the Moody's analysis "garbage" and argues that Trump's big tax cuts for businesses and individuals will spur growth. The selection of Indiana Gov. Mike Pence as Trump's running mate casts doubt on how fervent a President Trump would be on curtailing trade. Pence has been a strong supporter of free trade in the past, including voting in favor of trade deals with Panama, Colombia and South Korea while he was in Congress. The E*Trade survey was conducted July 2 to July 11 after the Brexit vote but before Trump's vice presidential selection.